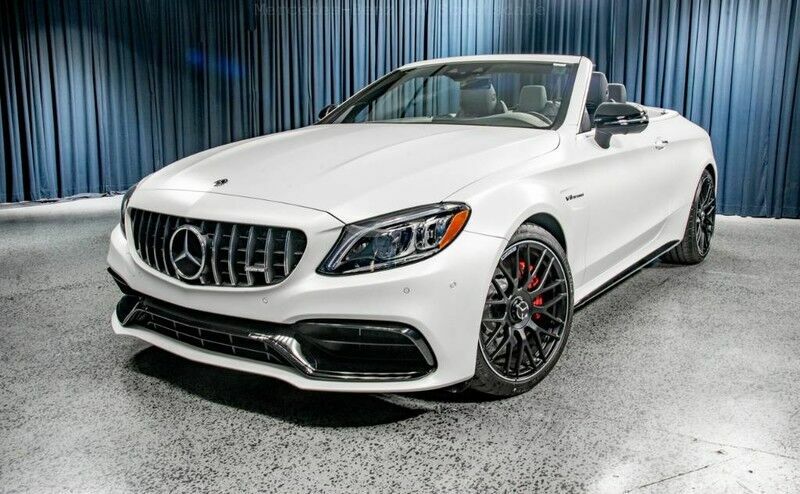 This 2019 Mercedes-Benz C-Class AMG C 63 S Cabriolet is proudly offered by Mercedes-Benz of Scottsdale This Mercedes-Benz includes: PARKING ASSISTANCE PACKAGE Automatic Parking Back-Up Camera EXTERIOR LIGHTING PACKAGE Headlights-Auto-Leveling PLATINUM WHITE/BLACK, NAPPA LEATHER UPHOLSTERY Leather Seats DRIVER ASSISTANCE PACKAGE Lane Departure Warning Lane Keeping Assist Adaptive Cruise Control Cross-Traffic Alert AMG TRACK PACE MULTIMEDIA PACKAGE Navigation System Hard Disk Drive Media Storage MP3 Player AMG NIGHT PACKAGE HEATED AND VENTILATED FRONT SEATS Cooled Front Seat(s) Heated Front Seat(s) DESIGNO MAGNO CASHMERE WHITE (MATTE FINISH) *Note - For third party subscriptions or services, please contact the dealer for more information. * The Mercedes-Benz C-Class AMG C 63 S Cabriolet is a well-built, yet compact and enjoyable ride that is unmatched by any other convertible on the road. With the ability to easily switch between having the top up or down, you'll be able to go about your weekday routine without feeling like you've sacrificed the weekend thrills. You appreciate the finer things in life, the vehicle you drive should not be the exception. Style, performance, sophistication is in a class of its own with this stunning Mercedes-Benz C-Class. Added comfort with contemporary style is the leather interior to heighten the quality and craftsmanship for the Mercedes-Benz C-Class Enjoy the drive without worrying about directions thanks to the built-in navigation system. Mercedes-Benz of Scottsdale is excited to offer this 2019 Mercedes-Benz C-Class. Very few convertibles have the comfort, style and performance of this well-maintained beauty. You deserve a vehicle designed for higher expectations. This Mercedes-Benz C-Class delivers with a luxurious, well-appointed interior and world-class engineering. This is the one. Just what you've been looking for. You could keep looking, but why? You've found the perfect vehicle right here.